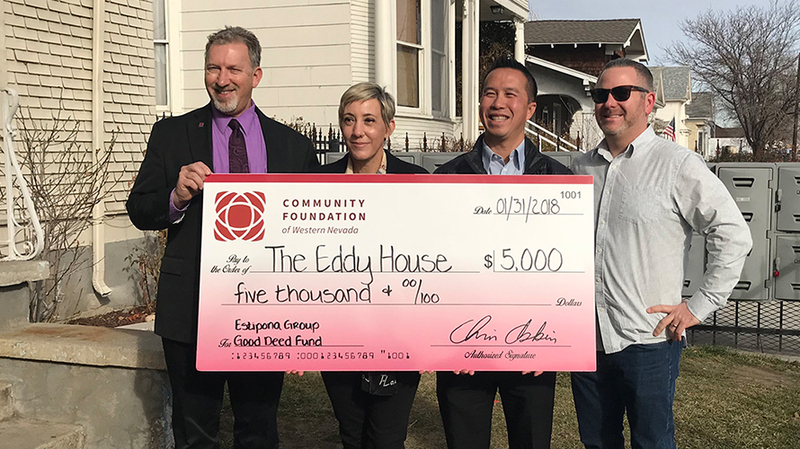 *drumroll*… and the winner of the 2017 Estipona Group Good Deeds Fund — and owner of a shiny over-sized $5,000 check — is the Eddy House! As you may recall (recall help), we committed to sharing our first year's Good Deeds Fund proceeds with a charitable group serving our homeless population. You applied, we evaluated (we being our crack team of community leaders - Hillary Shieve, Edward Estipona, Chris Askin and Michael Tragash), and a decision was made. Our runner-up, and recipient of proceeds from our upcoming 2018 Putt-Putt Golf Tournament, is the Domestic Violence Resource Center (formerly the Committee to Aid Abused Women, or CAAW). Twenty-four worthy organization vied for these funds – and we desperately wish we had checks for everyone — but we are confident our recipient will make the most of our contribution. The Eddy House's stated mission is to promote self-sufficiency and empowerment to homeless, runaway, foster, and other at-risk youth, ages 12-24, in an individualized, relationship-based, trusting environment by offering safety, basic needs, and access to community resources in Northern Nevada. We see a group of amazing people helping a vulnerable population navigate a tough world. It's hard to imagine a minor having to deal with the challenges and dangers of homelessness, but in 2017 the Eddy House served 769 kids experiencing homelessness. The work is not over, they need all of us to step up. Here's how you can help.